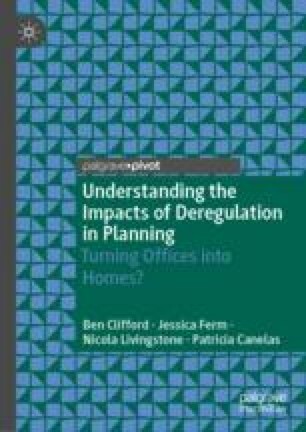 This chapter considers in more detail the way that the planning system in England operates, especially in relation to governing the change of use of buildings. The evolution of the use class order is explained, as is the precise history of the 2013 reforms around permitted development for change of use of office buildings to residential. The way a new ‘prior approval’ system for such developments was introduced is outlined. This includes consideration of exemptions and governance tools such as ‘Article 4 directions’ which can somewhat counter the deregulation in certain circumstances. Brighton and Hove City Council. (2014). Article 4 Direction—Office to Residential. http://www.brighton-hove.gov.uk/content/planning/planning-applications/offices. Accessed 29 August 2017. DCLG. (2012b). When Is Permission Required. https://www.gov.uk/guidance/when-is-permission-required#article4. Accessed 20 October 2017. Douglas Stevens. (2014). Use Classes Order. https://static1.squarespace.com/static/51b08e9ee4b0aa90845ee065/t/568e7cdcc21b861ff9011c5d/1452178652325/Seminar+3.pdf. Accessed 2 September 2018. LGA. (2018). 10,000 Affordable Homes Potentially Lost Through Office Conversions. https://www.local.gov.uk/about/news/10000-affordable-homes-potentially-lost-through-office-conversions. Accessed 1 December 2018. Local Government Lawyer. (2014). Borough to Pursue Legal Action Over Revocation by DCLG of Article 4 Direction. http://www.localgovernmentlawyer.co.uk/index.php?option=com_content&view=article&id=19657:borough-to-pursue-legal-action-over-revocation-by-dclg-of-article-4-direction&catid=56:litigation-articles. Accessed 1 November 2017. Planning Jungle. (2014). Part 1 of the GPDO—The 10 Worst Permitted Development Loopholes. https://planningjungle.com/wp-content/uploads/Part-1-of-the-GPDO-The-10-Worst-Permitted-Development-Loopholes.pdf. Accessed 2 September 2018. The National Archives. (2016). Explanatory Memorandum to the Town and Country Planning (General Permitted Development) (England) (Amendment) Order 2016. http://www.legislation.gov.uk/uksi/2016/332/pdfs/uksiem_20160332_en.pdf. Accessed 2 September 2018. UK Parliament. (1947). The Town and Country Planning Act 1947. https://www.legislation.gov.uk/ukpga/1947/51/pdfs/ukpga_19470051_en.pdf. Accessed 2 September 2018. UK Parliament. (2014). Written Statement to Parliament. https://publications.parliament.uk/pa/cm201415/cmhansrd/cm140710/wmstext/140710m0001.htm. Accessed 28 October 2017.